Commonly known as the ‘Paperbark Maple’ (for obvious reasons!) 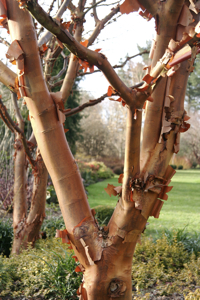 Acer griseum is a slow-growing small, spreading tree with very attractive chestnut-brown peeling bark. 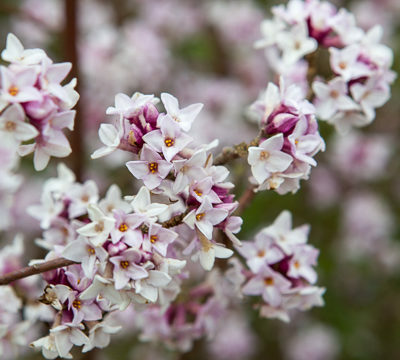 It is a great ornamental tree for the winter garden ultimately reaching about 5-10 metres in height. Its leaves start out orange in spring and gradually change colour through pinkish-brown, yellow and dark green until they change in autumn to orange and scarlet. Acer griseum grows well in full sun or partial shade and is suitable for most soil types but best in a moist but well-drained soil, so it won’t enjoy drought conditions. It’s fine in acid, alkaline or neutral soils too, and makes a great focal point for a small garden. If you yearn for some colour in late winter, then Eranthis hyemalis, commonly known as winter aconites, could be the just the thing for you. For maximum effect grow them en masse where they will spread around by self-seeding to create a carpet of bright yellow in January and February. They are very low growing (about 10cm in height) and have very pretty buttercup-like flowers above rich green leaves. 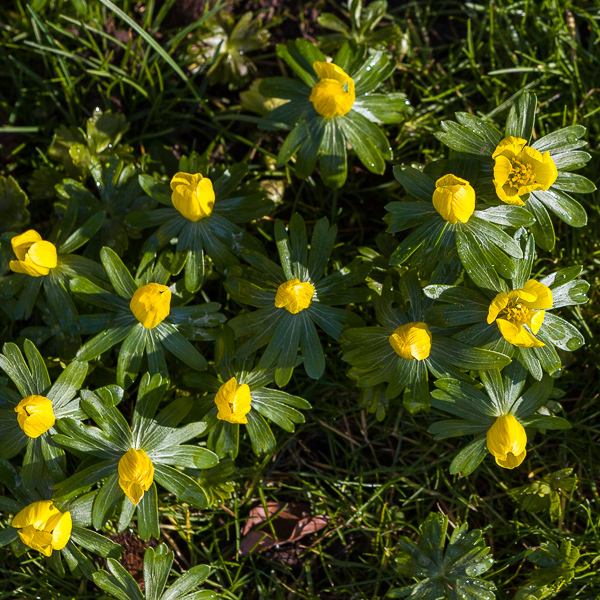 Winter aconites like a fairly rich moist soil (one that doesn’t dry out), and prefer alkaline soils in full sun or part shade. They’re quite vigorous so probably best grown in groups under deciduous trees and shrubs rather than in a mixed border where they may swamp other more delicate plants. I love Hellebores! They’re such useful plants as, unlike most perennial plants, they have evergreen foliage which makes them invaluable if you’re looking for something small to provide structure in your garden over winter. 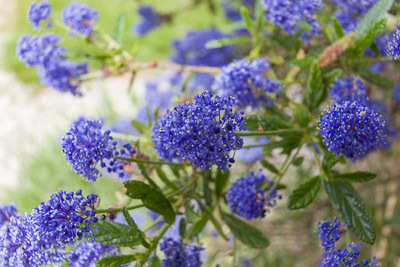 What’s more, they are happy in sun or partial shade and they produce really pretty flowers early in the year for a long period – and which fade nicely too. All in all, a seriously useful plant! Personally I prefer Helleborus orientalis because the flowers are so lovely. They come in a variety of colours from white, pinks, and very dark purple-black. 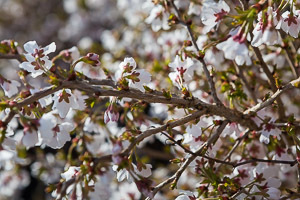 The old leaves should be cut back as they keel over when the flowers and new leaves appear at the base of the plant. 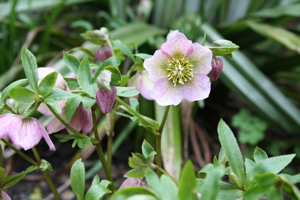 Other easy varieties to grow are Helleborus niger (commonly known as the Christmas rose) with its white winter flowers, and Helleborus argutifolius (the ‘Corsican Hellebore’) which is quite an architectural plant with prickly-edged foliage and pale green flowers which last for months. 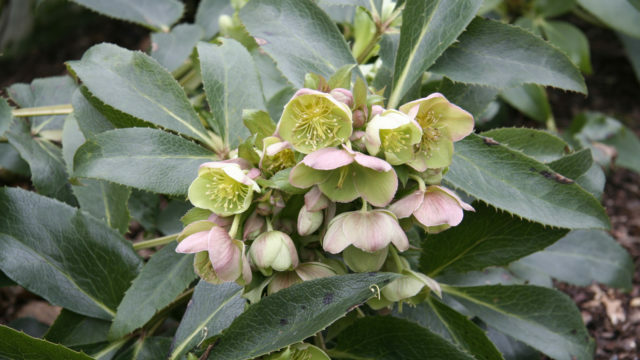 Helleborus sternii has very attractive pale green flowers which are tinged with pink (from February to April), and the taller Helleborus foetidus (charmingly known as the ‘stinking Hellebore’!) is better in shade than sun and will reach about 80cm in height. And of course if you grow a mix of varieties you’ll have flowers from Christmas till May! 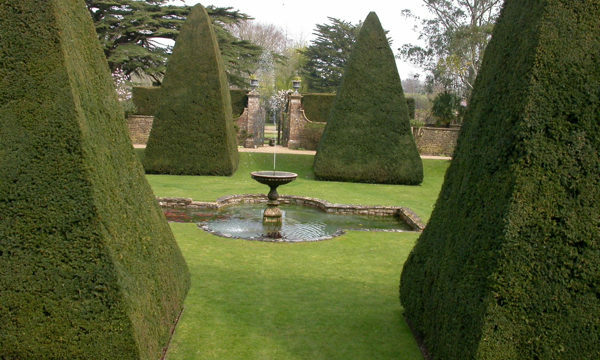 Evergreen shrubs are invaluable in the depths of winter when there’s not a huge amount going on in most gardens. But green, green and more green, can get a bit dull! 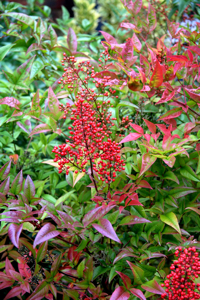 That’s why I like to grow Nandina domestica because it has very attractive foliage with tints of red in winter. It’s an easy upright and quite elegant shrub, and its common name is ‘Heavenly Bamboo’ which gives a clue about the leaf shape. 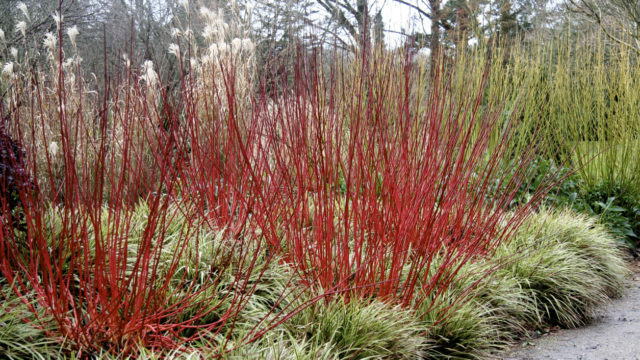 New growth in spring is tinted bronzy-red and it has sprays of delicate white flowers in summer, and then bright red berries in autumn, so it’s got a lot to offer. 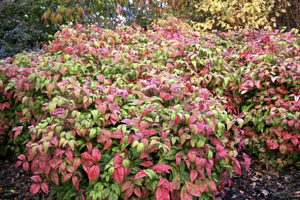 The dwarf variety Nandina ‘Fire Power’ has quite a different habit in that it’s a compact rounded shrub which makes it a very useful ground cover plant. In autumn the leaves have tints of brilliant red, and when planted in groups it makes quite a show. Nandina isn’t too fussy about soil type and does well in sun or some shade – but it can get walloped by very cold weather, so it’s probably best away from very exposed sites. To read more about other plants which are looking great at this time of year, just click on the links below.